Storytelling is a very powerful technique in teaching. This is something that our parish priest seems to know intuitively. In one of his sermons, he told the story of a Japanese man caught in a moral dilemma. How could he save Jews from his German Allies? Father never mentioned the name of this Japanese hero but I always remembered the story. After I became involved in Holocaust education, I learned about Chiune Sugihara. Indeed the USHMM had a thorough and interesting exhibition on the subject. It is estimated that 40,000 descendants of the Jewish refugees saved by Sugihara are alive today because of his courageous actions I bought a video about this remarkable man, but it was a stilted work and not well received by my students. So I have learned to simply tell the story, and I use this PowerPoint presentation as a background. The Holocaust Chronicle. 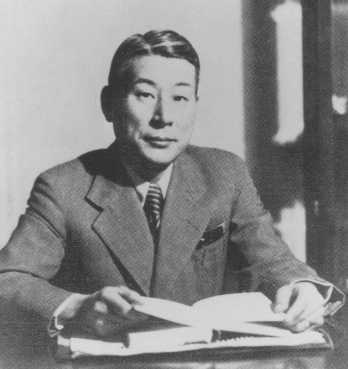 Sempo Sugihara.